Stems: Erect, several to many, often branched, ridged, glabrous, reddish. Leaves: Opposite, simple, sessile, oblong to linear, .5 to 1.5 inch long, less than 1/3 inch wide, glabrous, glandular-dotted; margins entire, rolling downward; tips pointed to rounded; upper leaves reduced. Inflorescences: Cymes, densely flowered, leafy-bracted, terminal. Flowers: Sepals 5, linear-lanceolate, unequal; corollas 3/4 to 1 inch wide, petals 5, to 1/2 inch long, bright yellow to orange-yellow, margins black-dotted; stamens numerous, in 3 clusters. Fruits: Capsules, egg-shaped, to 3/4 inch long; seeds small, pitted, black or dark brown. Habitat: Prairies, pastures, waste areas, and roadsides, most abundant in sandy soils. Toxicity: Plants contain hypericin, which causes a photosensitive reaction following ingestion. This toxic reaction can be fatal to sheep and goats, which readily graze the plant. Uses: Native Americans used St. John's-wort to treat fevers, coughs, intestinal problems, nosebleeds, and snakebites. Comments: The dark spots on the petals are said to represent drops of St. John's blood. 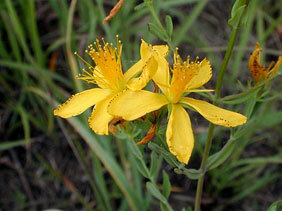 St. John's-wort has become a problem weed in the western portions of the U.S., where it is known as Klamathweed.